The Highlands 500 waits for a while.It’s a pre -booked train journey. In 1998 (told you I am old !) , I took a middle age crisis , motorcycle trip to the Bol D’Or motorcycle race at Paul Ricard circuit in the south east of France. You can shortly read about this in one of my Amazon books. Ever been hunted by French Hells Angels ‘cos a nutter thinks you got off with his missus?????? We took the bikes by auto train from Bercy in Paris to Avignon and onwards to the 24 hours race. 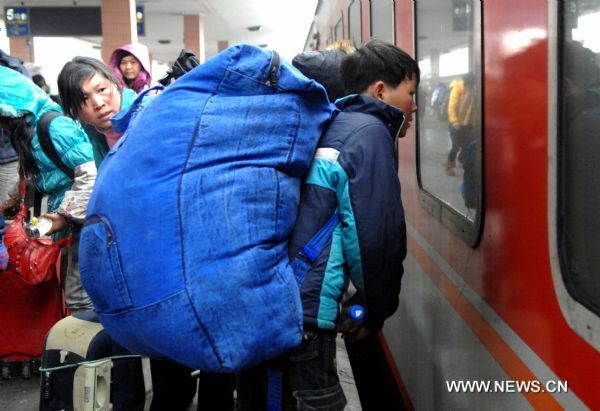 I spent the night on the sleeper train with female students, but it may not be the way you think. Luggage WAS a problem. You have to carry a tent plus clobber! Plus sleeping bag plus clothes, toiletries , ……… whatever . My mate and I needed quite a lot of kit . We had to transport it on the bikes but also carry it on the train. Helmets, gloves, elbow and knees pads. Back protector. etc etc etc. 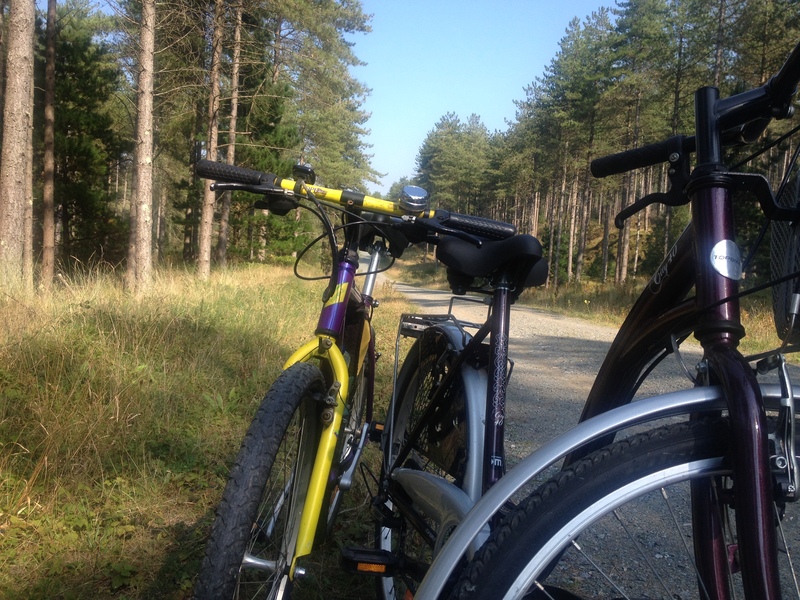 The bikes went on one train and we travelled on another. Gallic logic. I do recall a hot dog which had a “Navel!” . At Bercy. The biggest issue , apart from worn tyres and 70 mph rear wheel slides on my 750 cc Yamaha death trap ! was how to carry all our needs in saddle bags and a huge 100 litre kit bag each. My mate, bought an identical bag as mine from the same stall at the local market . Same colour! What are the chances of that………… ? Shortly, we are off to Scotland. No camper van. No virtually unlimited luggage. You want it? Carry it on your back! It is an issue. With NV200 with us, it’s soooooooo easy. Load it on board and you got it. Without our “life support system” it becomes more difficult. Do you really need the big binoculars?. TWO jumpers? How many shirts for just 2 weeks? It does make you realise how useful that camper van really is.Can we do without it? A visit to the Ballet in Glasgow and walking in the rain. Tweed jacket or nylon pak? One book or two? Magazine(s) ? We had to buy another 80 litre bag for clothes. A tablet , not the laptop. Can I cope with 2 days per shirt. (I can but my wife…………. ?) A can of Cool Water or Chanel weighs less! What a pain in the …………..
A two week tour starting in Glasgow. Steam trains to Fort William, Mallaig and a spell on Skye. Having a great time! Talisker malts and Blends. Salmon, kippers and organic porridge. Walking in the mist. Getting to know ” baby” grandaughter again. Heaven on earth! But would it be better with campervan with us? I think so. 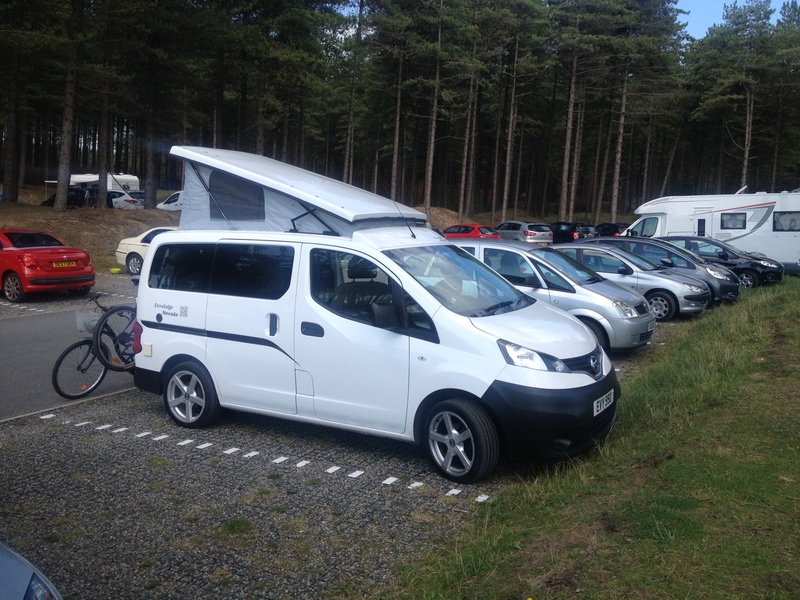 When you do leave the camper van style of travel behind, you realise just how convenient life can be with a Drivelodge conversion. 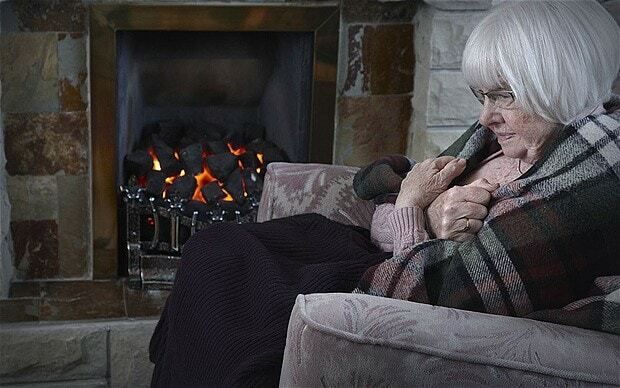 It can still be great fun, But some how not quite so comfortable…….Back soon ! 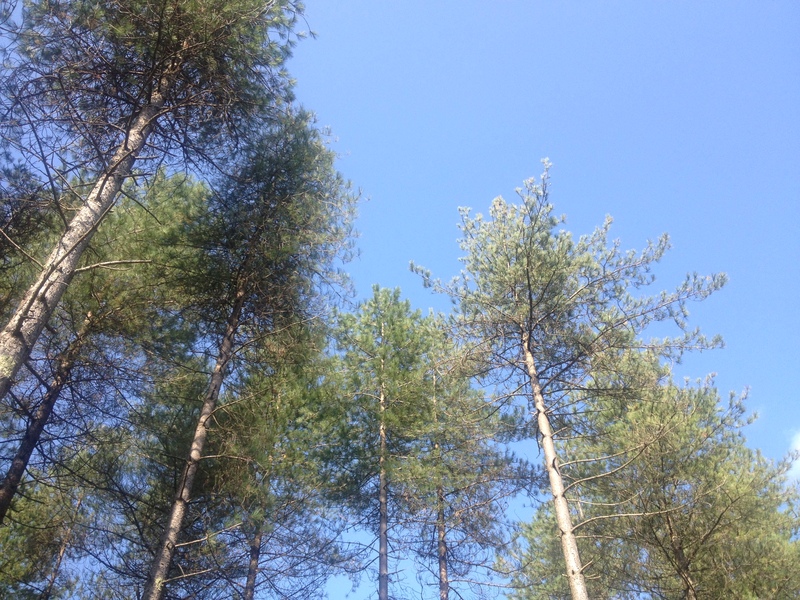 This weekend, we spent two days out and about in the campervan enjoying some of the last (?) of the Indian Summer sun. We had a feast of Antique browsing. First we went to Uttoxeter racecourse where a Fair was being held. A few of the sellers were sleeping in vans, motorhomes and caravans. One couple were obviously storing their wares in a tent overnight and sleeping directly in their unmarked LGV.Stealth camping at it’s best. We had a gourmet lunch at the Saracen’s Head, Weston , on the Uttoxeter to Stafford road. Then onward to Bingley Hall, Stafford for the Bowman’s Antique fair. Today we visited two more Antique shops in Wrexham. It’s what we enjoy doing.Sometimes when transporting Antiques , for example, we lose access to the fridge and the porta potti. I had been searching for NV200 related news to add to my own Blog. Many NV200 converters and users are now Blogging , which is very encouraging. I was flattered to read a reference to my own scribings on the NV200man’s website. It mentioned that due to insufficient space in his campervan, Dinkum used a bottle to pee in at night! Indeed , I did mention that we carry both a “He wee and a She Wee” for emergency use when we cannot access either the porta potti or a shower block when on site. Access to your own Porta Potti is an important feature if you are self building. Although the comment made me smile, it is serious point in my mind. Whilst “stealth” camping just outside a ” closed for the night” campsite , in a forest outside Orleans, France, we were once very glad indeed NOT to have to leave our home on wheels, for a pee, when we were surrounded by ,thankfully, inattentive, very drunk , young, French soldiers dealing drugs from a car parked alongside us and celebrating Le Weekend! I am now following NV200man’s Blog. Vive le difference ! Last Sunday, the weather was just delightful. 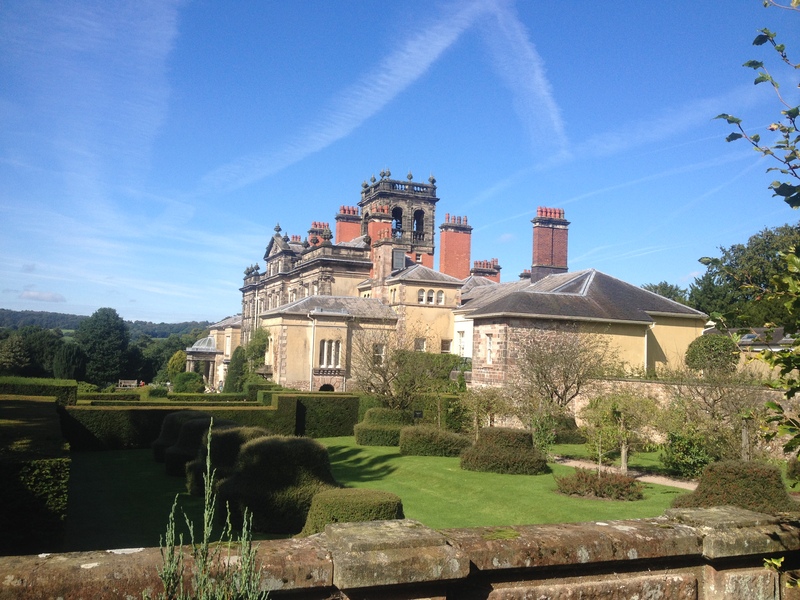 We made the relatively short hop to Biddulph Grange Gardens on the edge of the Peak District and Staffordshire Moorlands. The National Trust obviously take pride in their cafes and restaurants and the light Sunday lunch hit the spot. 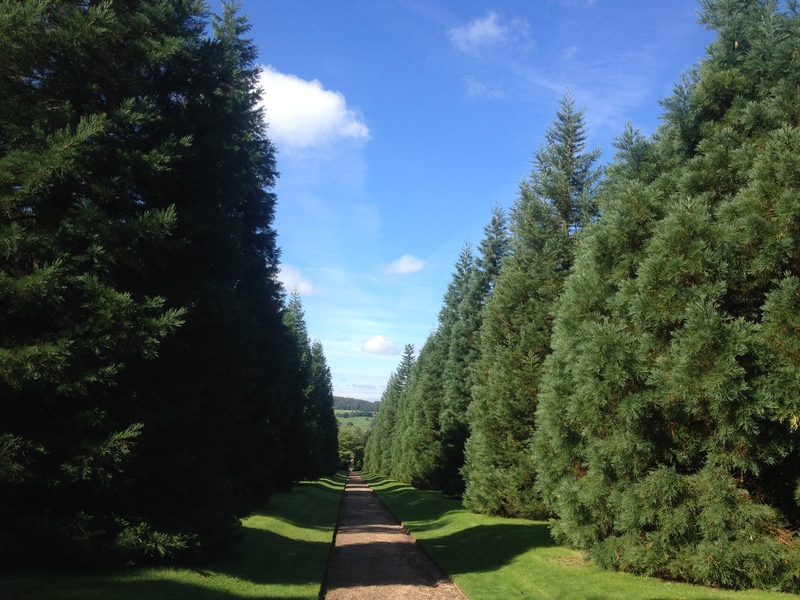 We went for a walk around the stunning gardens , making our way all the way to the eastern boundary. In the vegetable garden, Autumn was evidenced by ripening pumpkins but the flowers were still in full display in the warm sunshine. I had an interesting chat with a Lady in the James Bateman “Creational Hall” where in the mid 1800s he tried to display how the bible’s creationalist passages equated to geological findings, such as fossils. The Lady had good geological knowledge and she pointed out the small coalfield around the Roaches, a ridge of rocks, high above Leek in the Staffordshire Moorlands. She was surprised that I knew of the coal outcrops and shallow seams. I explained that as a young engineer, I had been seconded to help fill in several “bell pits” near to Axe Edge, which posed a threat to ramblers. We also talked about the “Black Bull” pit at Biddulph, AKA Victoria Colliery, where I had worked whilst training with the then National Coal Board. Today, to escape from a long list of domestic chores, we visited Attingham Park, at Atcham near Shrewsbury in Shropshire. 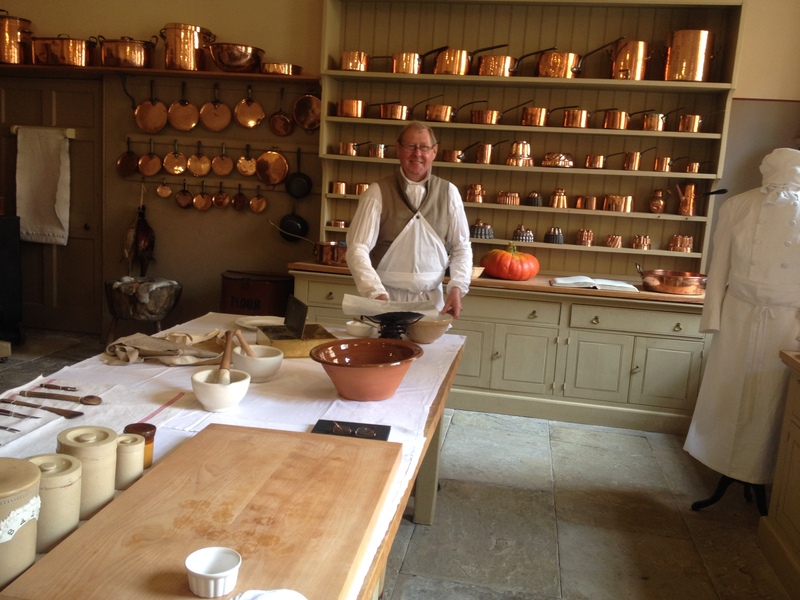 As we approached the kitchen, we could feel escaping warm air, scented with baking. 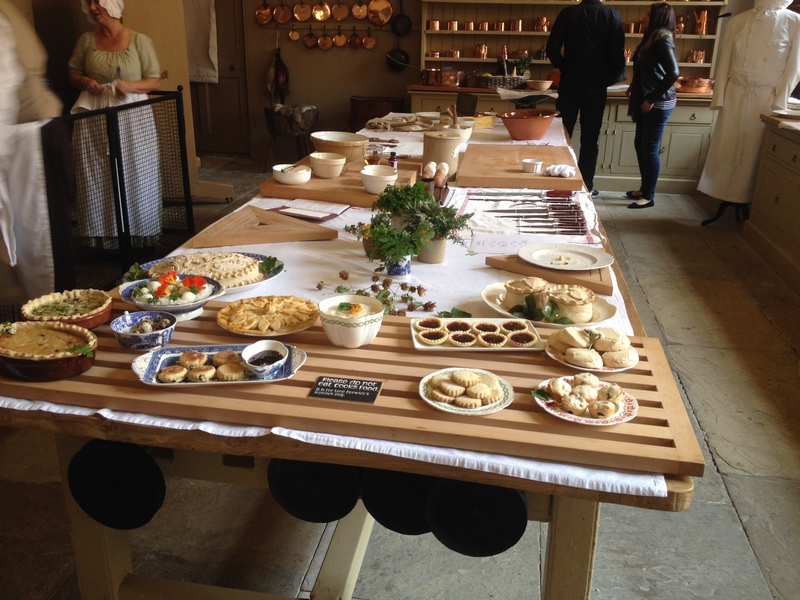 Inside, a Chef and Cook in period costume brought the place alive. They were baking typical foods ,which would have been eaten over the last three centuries or so, at the banquets in the massive dining Hall. 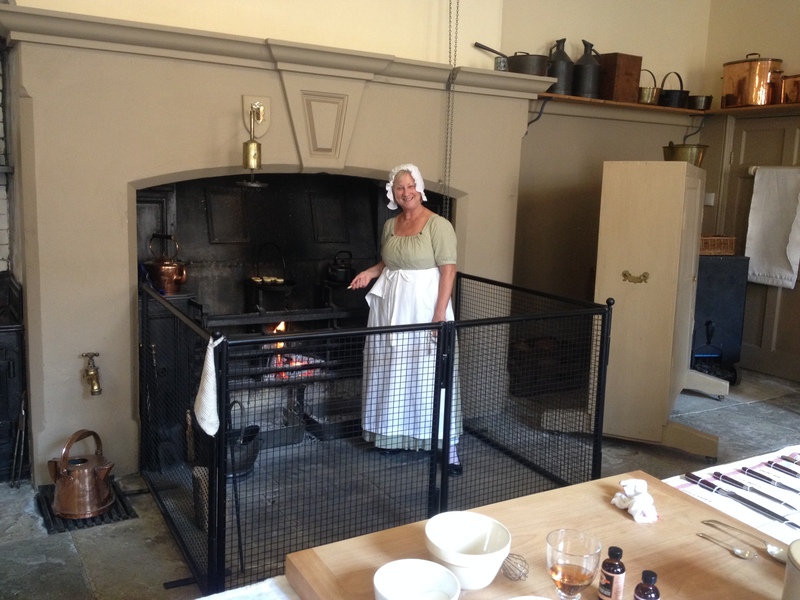 The lovely Lady, posing as Cook, took some scone like cakes from over the fire. They were buttered and we took up the offer to taste them. They tasted as good as they smelt. Simple with a few currants baked in. There was a definite mild flavour of wood smoke which made them very special indeed ! A quick stopover at the Antiques emporium in Church Lawton finished off the day. Another superb day out in the campervan! The Avon tyres are now well run in and I am convinced that they give a “smoother” , more comfortable ride that the previous Michelins. Pressures are identical, so maybe it is something to do with differences in sidewalls??? There is no increase in noise levels from the Avons, despite the ticket claiming a 1 dB higher rating. In theory that’s a doubling in noise level, all things being equal. It does not appear to be the case. I would put them about equal for noise reduction. That’s good ! Autumn ? Surely not ? This picture dates from the end of August. Tomorrow is the first official day of Autumn in the UK. I am still wearing short sleeves and shorts and riding my bike along the canal. There is little sign, locally, of any colour change in the leaves which are still hanging on in there. A few apples have fallen in the garden, but that is mostly down to mis-management by lazy gardeners (us !). We have not yet harvested any plums or apples, just a few pears which my wife could not resist plucking from our little trees. When showing our Romahome owner and on-site neighbour our conversion on Anglesey, I did notice that the Gaslow indicator is showing a need to top up the refillable LPG in readiness for the cooler weather which has to come soon. We also need to replenish the campervan with quick and easy lunch time food and drink. You know the stuff. Soup, a selection of hotel room type hot drinks and dare I say it , at least a Tomato and Beef (LOL) pot noodle! We currently await our friend’s recovery from an eye operation before we can re-run the gourmet picnic lunch. No pot noodles to be involved there…. ahem. As long as it is not pouring with rain as I do have to have a table outside the van to cater for 3 courses and plates and utensil swaps. The new Fiamma awning can cope with light showers though. Really looking forward to this to give our chums a good send off to their pastures new by the sea. 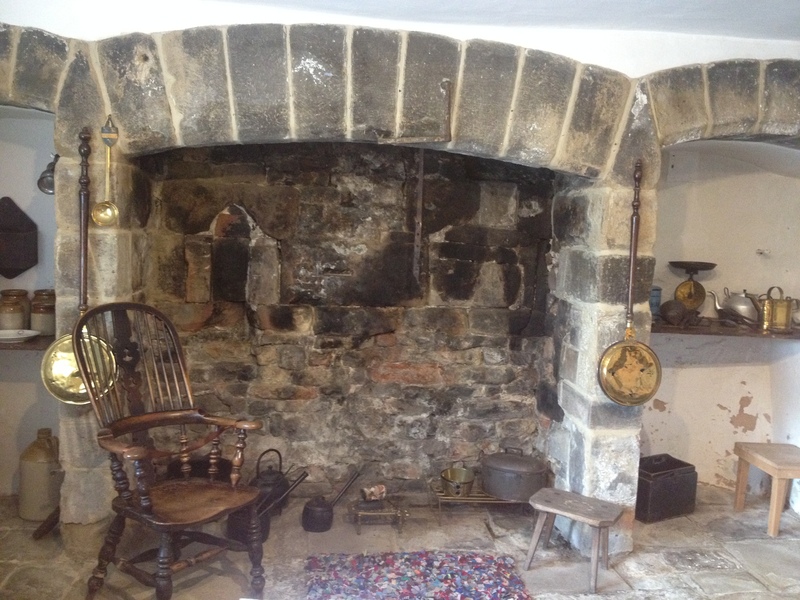 I do not think that outdoor activity is over for the year, by any means, but when we do retreat to the log burner, we at least will get the chance to search the archives for those promised posts and get the indoor chores done. The campervan and caravan will remain, ready to roll so long as I can get grip from the tyres. Not hibernating just yet! Nothing better than a Cornish pasty on the harbour wall so long as you have your big fat jumper on. With the Newspapers going crazy about the hottest weather for September since the birth of time, we set off on Monday morning for Anglesey or more correctly, Ynys Mon. 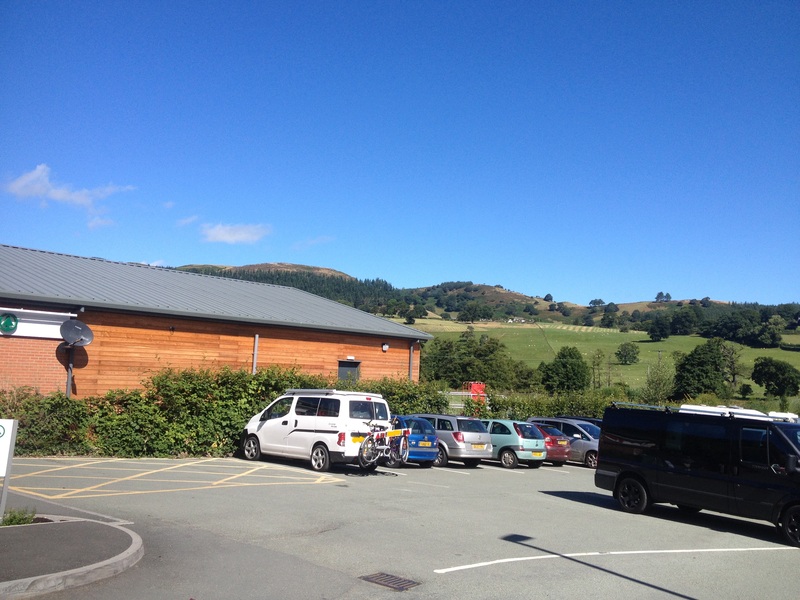 It was quite sunny and we enjoyed the steady drive up the A5 from Llangollen. We did encounter a “steady Eddy” who insisted on driving at about 30 to 35 mph on the long approach to Betwys Y Coed. The ol’ fella then drove through the very busy town at about 40 mph, not even swerving to avoid pedestrians. Oh dear. We had a very lazy evening, lounging around in the Caravan and next day, in the rain (anyone awake at the Met Office……….. ?????) 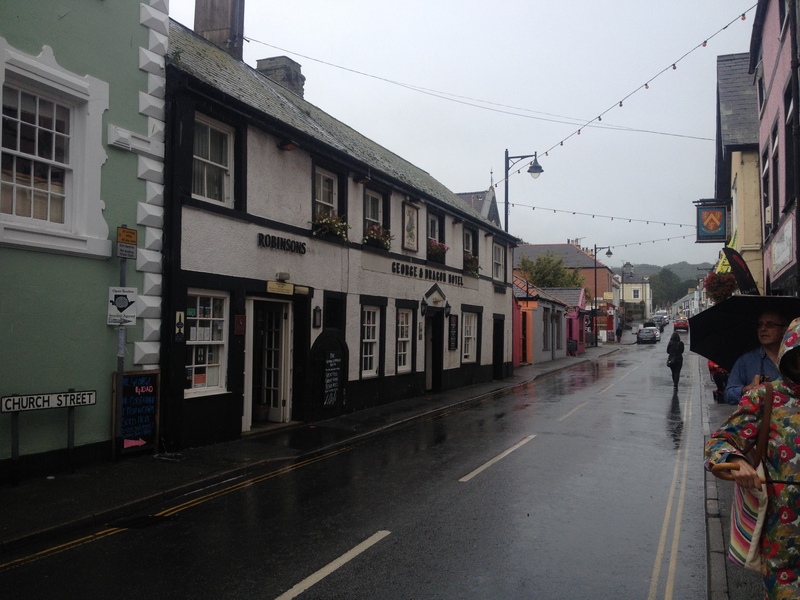 we drove over to Beaumaris for lunch at the George and Dragon. This pub, dating back to at least 1410, provided the best Cod and Chips that we have had for a very long time indeed. The Robinsons Dark, on draught, was fine accompaniment. The weather picked up for the afternoon and we carried on west to Plas Newydd, one of our favourite National Trust properties. The weather was dry and warm but what a difference from our last sun soaked visit . 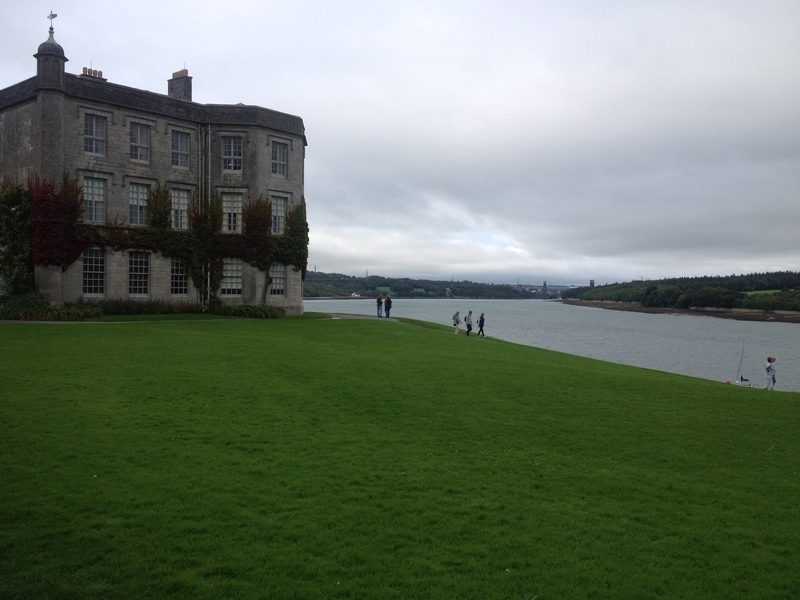 We toured the house then sat watching the boats on the Menai Straits. A gentleman came along with his King Charles spaniel. He had lived in the village on the mainland to the west called Y Felinheli. In 1951, when he moved there as a child, it was still on exporting dock for slate from Llanberis. The land all around the village belonged to Lord Duff. Vaynol Estate dated back to Tudor times. The gentleman’s father had been Clerk of the Works for Lord Duff. Lord Duff had married Lady Caroline from Plas Newydd following Rex Whislter’s sad demise in WW II. Rex had been in love with Caroline but it was a future doomed by war. The gent told us that Lord Duff was a good employer. He had been visited by Lady Caroline when he suffered illness. The gent had worked on the dry dock at Y Felinheli and also helped lay the road deck on the bridge nearest to Plas Newydd. He remembered Lord Duff converting a small harbour into his own swimming pool but it enjoyed little use despite the huge cost involved. The most dangerous section of the straits were pointed out to us. What a priviledge to meet this Gent. He told us about the abundant deer, hundreds of herons which vanished following some 1960s factory developement and how workers from Ynys Mon used the ferry which used to operate from Y Felinheli to take them onward towards the slate works at Llanberis. Some stayed away from the Island for a whole week’s working. Some from the dock went back and forth each day. Wednesday dawned hot and sunny. 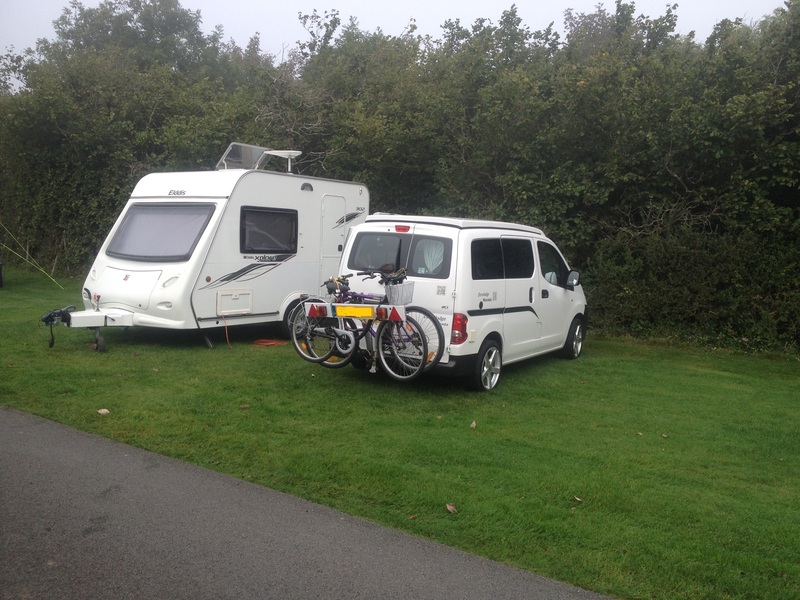 We drove down to the south west tip of the Island, camped up for the day with the campervan and put the bikes to good use. It was baking hot. The slight sea breeze just making it comfortable for a bit of exercise. We only managed about 7 miles or so but better than none. That night we had dinner at The Bull , on the A5025 between Benllech and Marian-Glas. 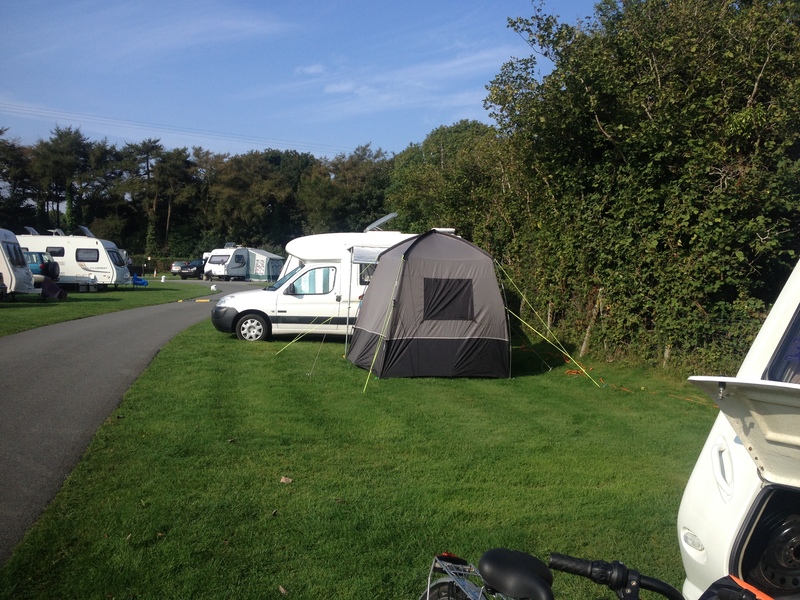 On Thursday we headed back down the A5 but not before chatting to a chap with a Romahome at Cae Mawr caravan club site. He had enjoyed his R20 Romahome for ten years. The layout was very practical. A dinette on one side for two and a long sofa for lounging on the other. A small kitchen to the offside rear and a a porta potti and wash basin to the nearside. He had previously owned a series of Dandy folding trailer tents and to crown it all, a Fiat Bambino, similar to my wife’s uncle’s Pandoro. These tiny, 850cc engined wonders went slowly and rotted gently from day one, but they were great fun. I am determined to find my original advertising Fiat brochures to post on here. The journey home was in lovely sunny conditions. 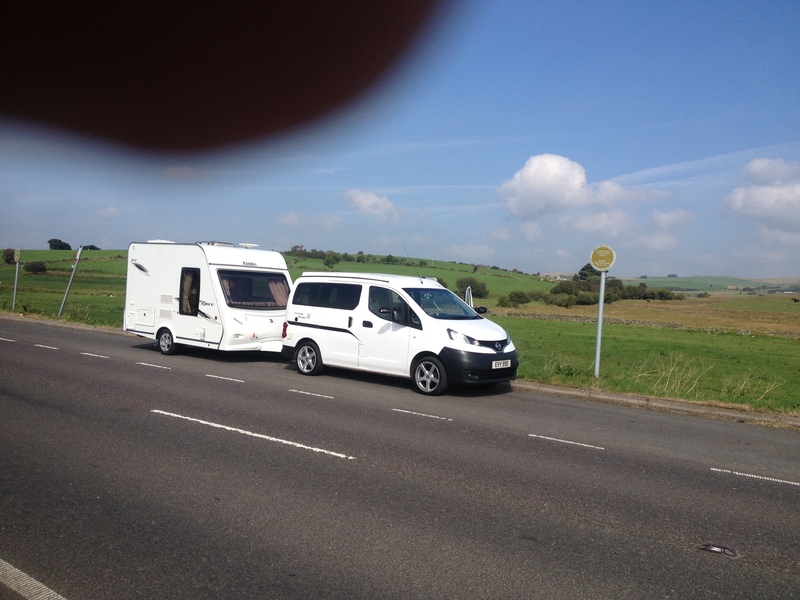 That UFO above the Elddis is my much photographed finger…………… This was a comfort and lunch break south of Cerrigydrudion, close to the karting centre. I used to whistle my Cagiva Raptor down that straight……….. I enjoyed the bikers whipping past my open cab window but my wife was not enlivened by this impromptu spectating. I do miss that Suzuki TL engined 1000cc twin. SOB ! Determined to get in a trip to Cornwall and another to Portsmouth. 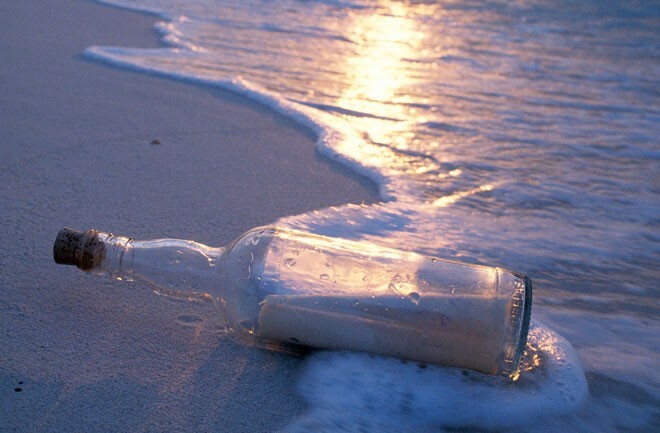 Probably take the caravan to Poldark land and go solo to Portsmouth. Regardless of the weather ! Went to fill up the Campervan late this afternoon and spotted a white Fiat 124 Spider outside our local Fiat dealership. On the way home, in bright sunshine ,I could not resist a quick look. This was the first 124 Spider that I had seen in the metal. As they were closing, I was rushed inside to sit in a black version which was unlocked. I absolutely loved it ! Nice aggressive stance. Familiar (to me) Fiat interior features and a quality look and feel. I was given a super brochure and price list and was urged to return to drive one. When I got home, I returned to cleaning the campervan. The windscreen was badly smeared on the outside and I re-washed it and added a “Rain-X” coating for good measure. This worked so well on our previous Fiat Trigano Tribute that you could get away without using the wipers in most rainy conditions which really surprised at the time. The angle of dangle of the windscreen must have been just right? 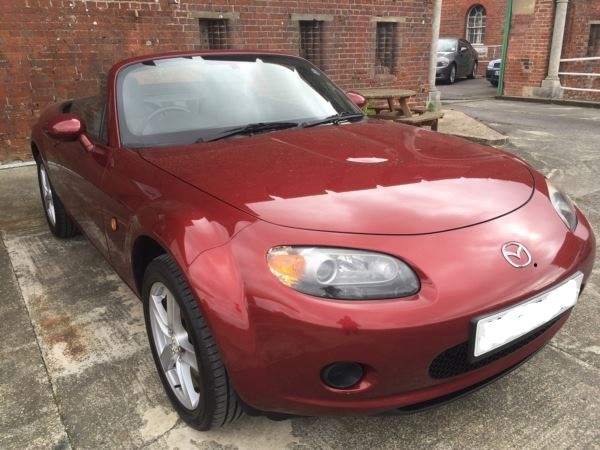 Anyway, as I was mucking about , balancing on one foot on each front wheel in turn, to reach the NV200 windscreen, my good friend showed up to show me his Mazda MX5 . A Mk III with 2.0 litre engine, bose sound and electric folding hard top. The colour, misleading called ” copper red” was outstanding ! I would call it metallic maroon or ox blood. A VERY smart looking motor indeed ! This photo of a similar car simply does not do it justice. 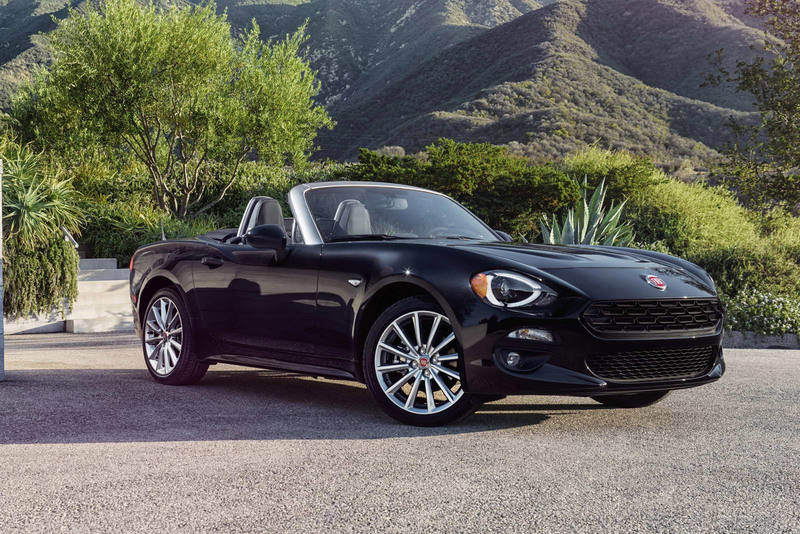 As you probably know already, the new Fiat 124 Spider is based on the new Mk IV MX5. I have to say that my mate’s timing was immaculate (like his 20 odd thousand mile car !) A quick spin along the lanes confirmed a swift, lovely handling sportscar.The electric hard top alone would swing it for me but many purists still want a soft top, I am told. 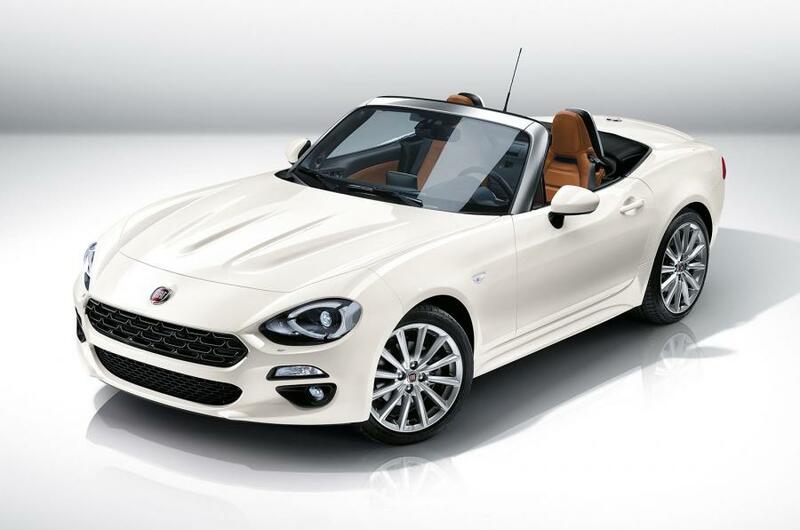 No wonder it’s the best selling 2 seater sports.Not sure that I could ever justify spending sooooooo much more money to own a brand new Fiat Spider. 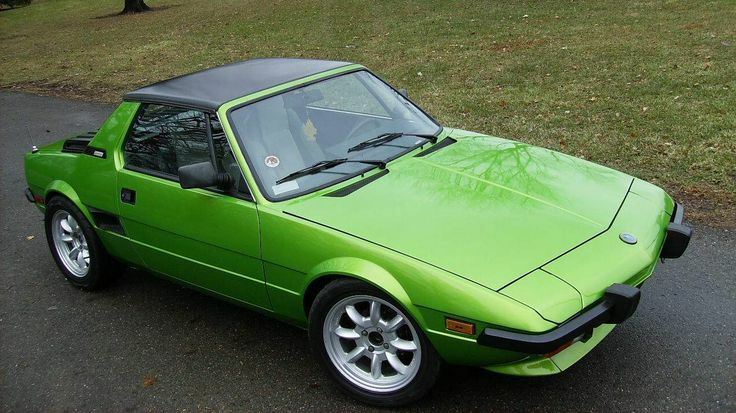 Even to try to bring back the experience of our little Fiat X19 that we strove so hard to buy way back when. Food for thought.The Fiat does not come in metallic green. It is a colour that we have had on 3 of our previous cars. A delighful dilemma for another time I think.It’ s so nice just looking. 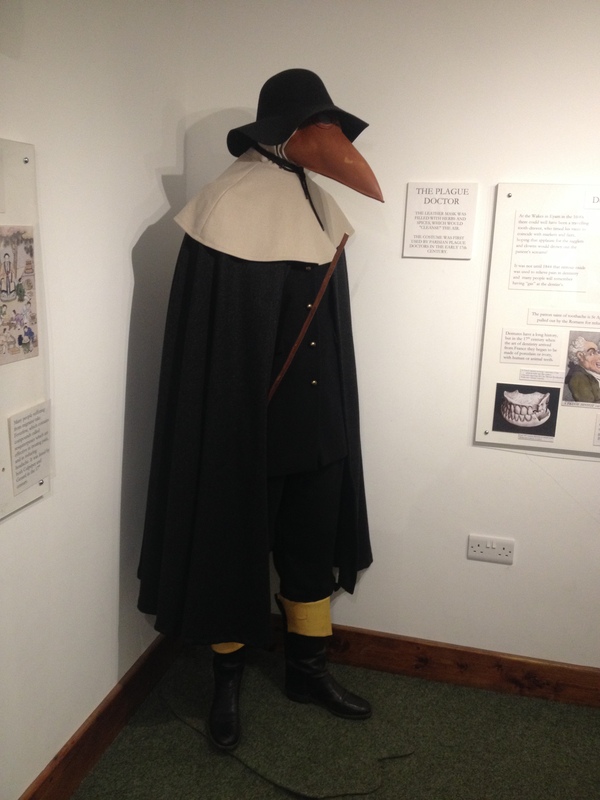 If you were unlucky, in or around 1665 and caught the Plague and rich enough to call a Doctor, he may well have showed up wearing a leather “beak” mask like the one shown here. Invented in Paris , with the beak filled with scented herbs to ward off the evil within the air, your Doctor would come and treat you with a variety of weird and wonderful and mostly useless potions , coupled with useless advice. You would probably be horrified to see this masked ghoul and then desperate as you realised he was the plague Doctor, come to treat you. Instant diagnostic method . Poor bedside manner! 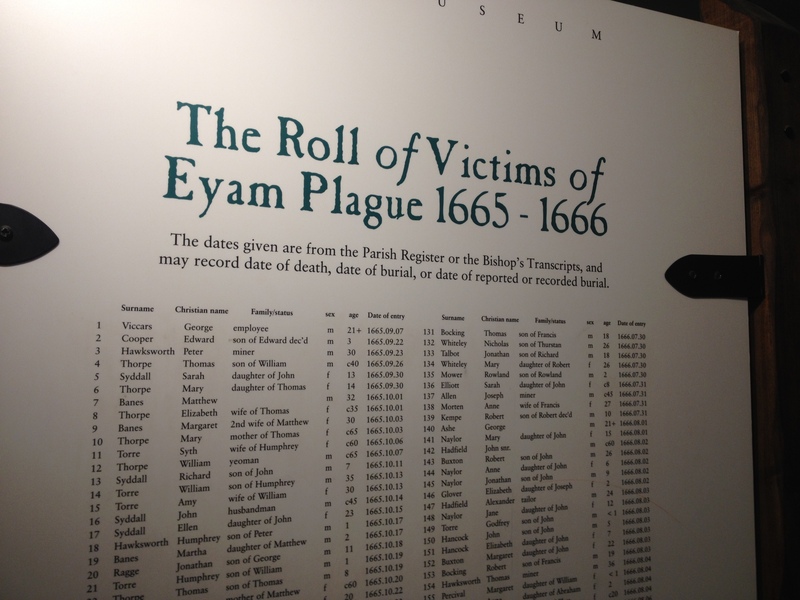 When George Viccars, Tailor of Eyam , brought contaminated fabrics from London into the village, little did he know of the deaths and desolation it would cause. He was the first to die. Click on the pics to expand and see for yourself. 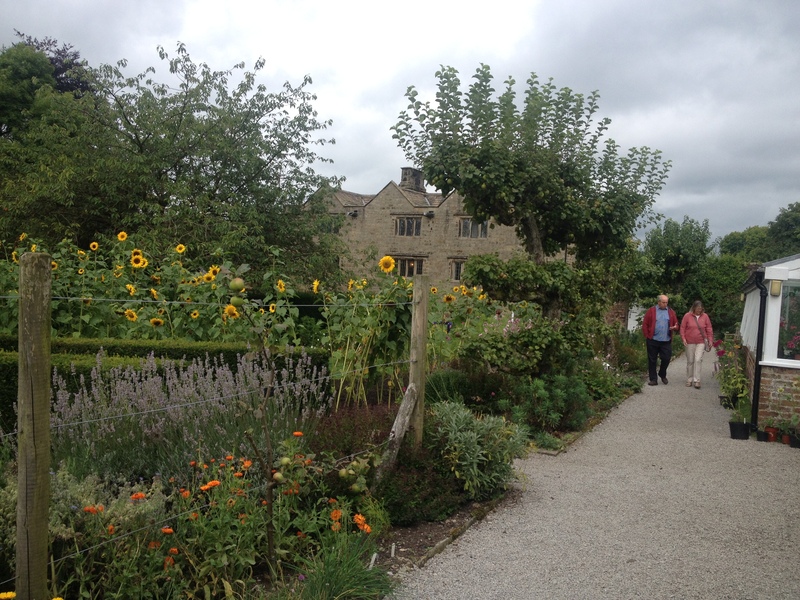 Today, we headed for the National Trust property, still owned by the Wright family. A village and place full of history and character. This is the banqueting house in the Hall Gardens. 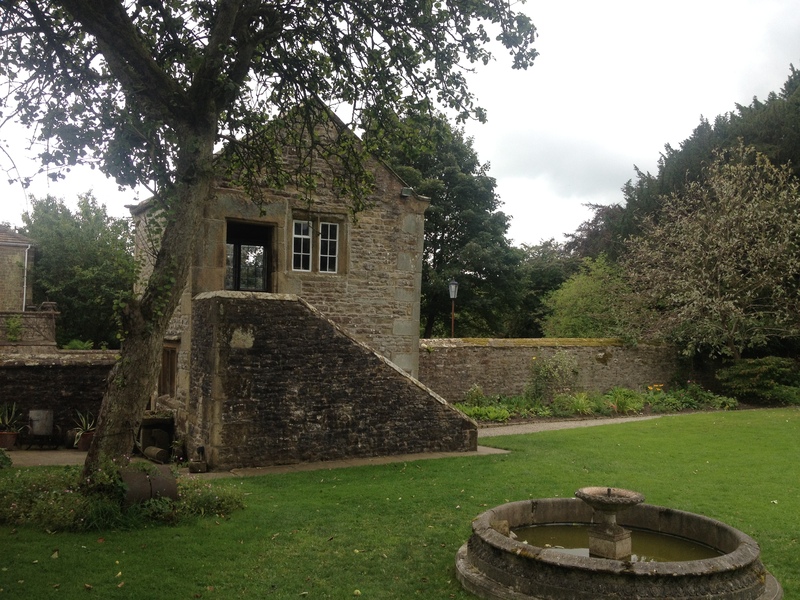 A two storey, stone built building with open fire to warm guests during after dinner parties held within the hall itself. With views of the beautiful gardens, it is now a garden store. 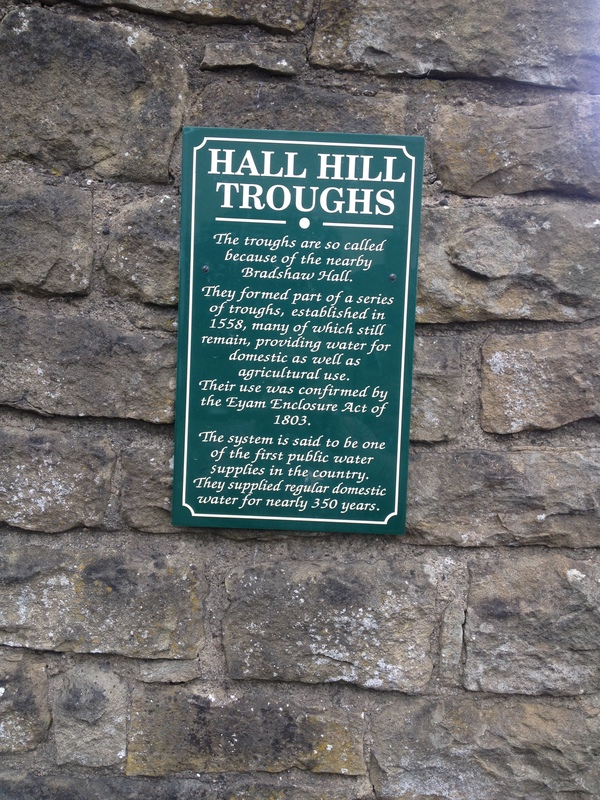 The village probably had the very first public water supply in the country. 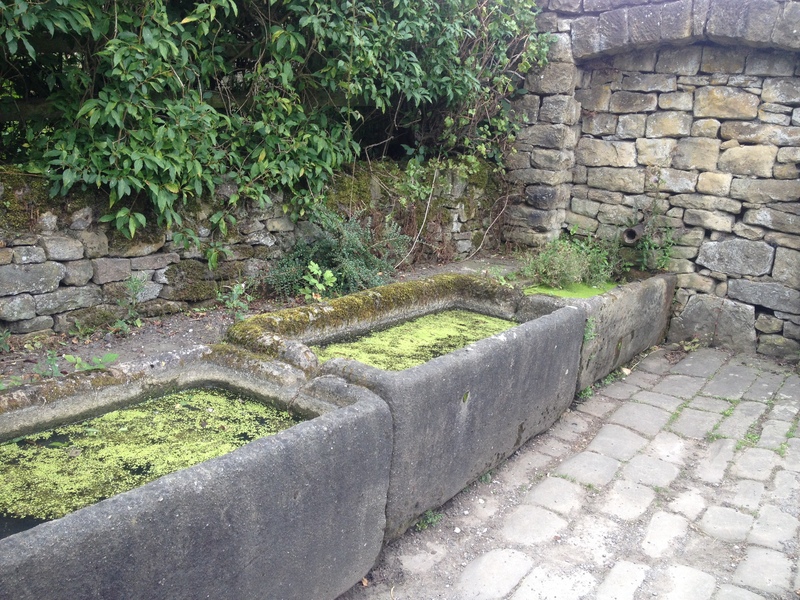 Water soaks down through the limestone crust into the grits and strata below to spring up to feed large troughs in a couple of locations in the village. The village has seen lots of lead mining. This is how the money to build the Hall was generated. There has also been quarrying, silk weaving, shoe making, agriculture and much more. The museum shows a history of endeavour, hard work and hardship. Tough people these Peak District folk ! Both the Wright family and the people of the village were heavily hit by the events of WW I. 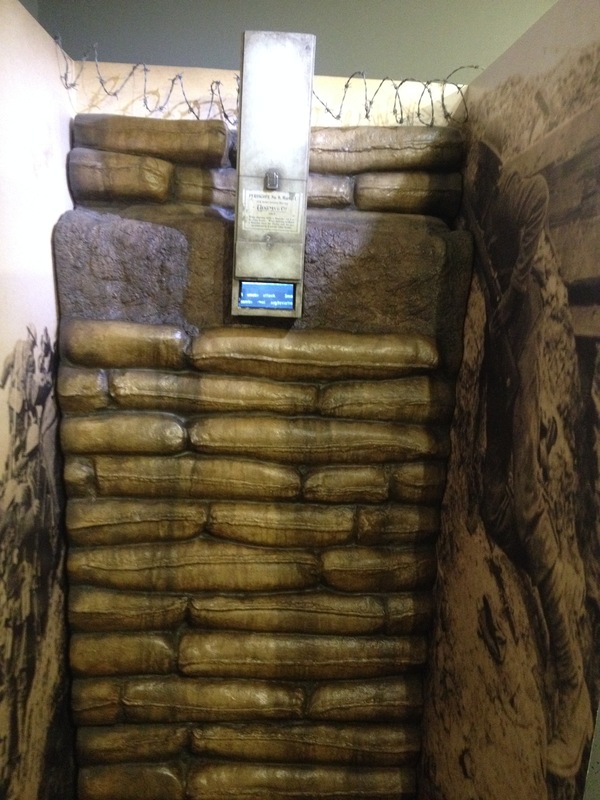 The museum currently shows exhibits regarding this. 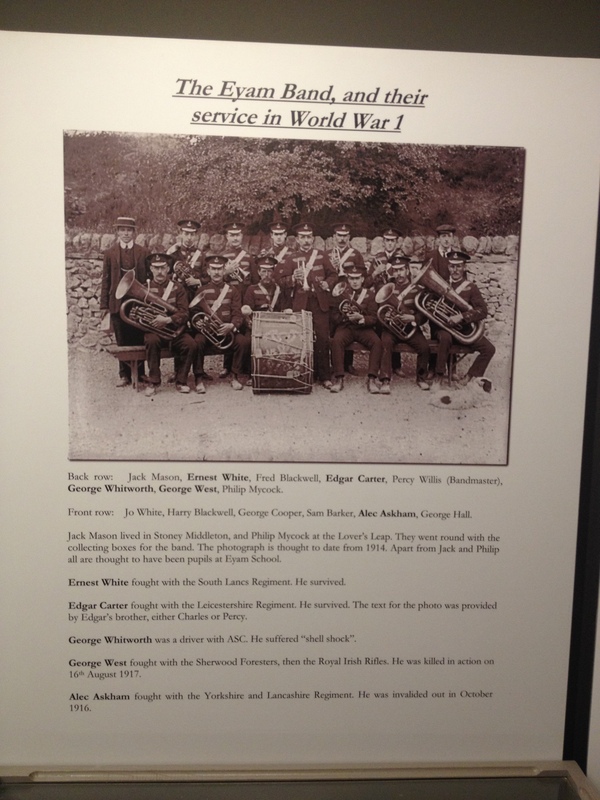 Many of these bandsmen never returned from France. Many with no known grave. They probably played at some village festival or works celebration or even in the Garden of the Hall perhaps. Just looking through the spyglass in the mock up of a trench and watching shells explode, red hot shrapnel rain down and men shot to death does bring home the horror of what happened in 1914-1918. 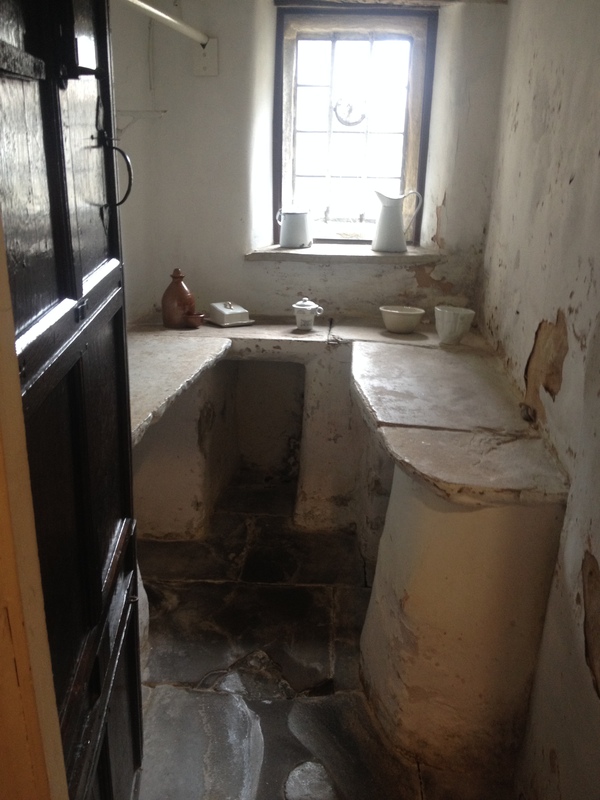 In total contrast to these stories of infection and despair,the Hall itself retains a warm, welcoming atmosphere, brought about by the belongings of the Wright family when they left the buildings about three years ago. With the option to move back in again, I would say visit this N.T. Gem as soon as you can. Whilst you can. We came away loaded with Hartington cheeses including Hartington Blue and a Ewe milk version for the best crackers we can find! We also bought some local beers. Choosing mainly stouts and porters, they will get stored until the next family get together. The cheese will not last that long. 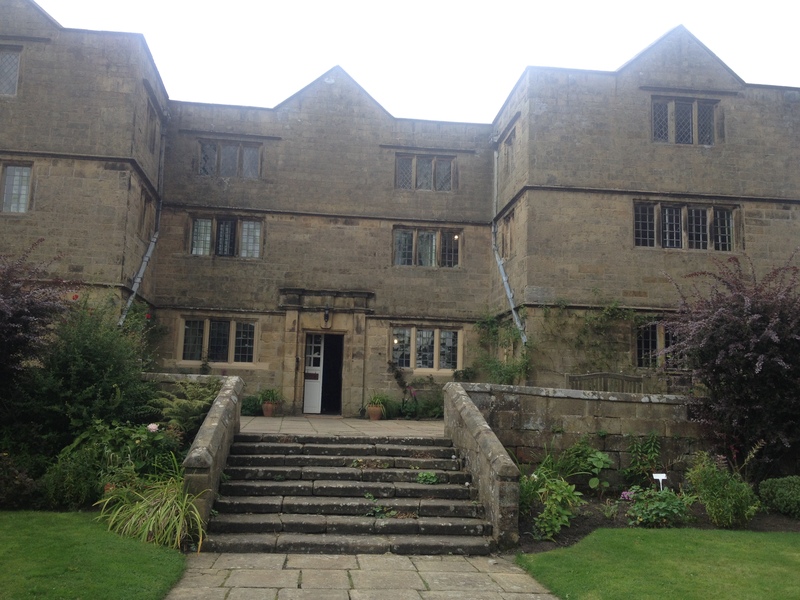 Both shops, on site at Eyam Hall. The one hundred mile round trip gave us the perfect excuse to run in the tyres. Don’t forget to see the previous half dozen new posts, recently put on. You don’t want to miss anything, do you ?